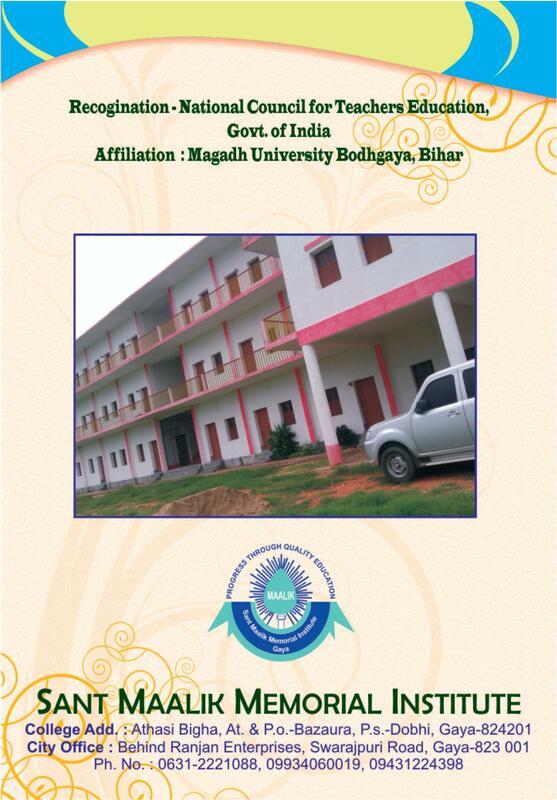 Sant Maalik Memorial Institute, Gaya is recognised by National Council for Teacher Education, Govt. of India. The College is also recognised by Ministry of Human Resource Development, Govt. of India & Bihar. On the demand of fast multiplying needs of the hour, "Sant Maalik Memorial Institute has been in efforts to cope-up with the prevailing set-up of the people's mind to prepare a solid base for their children so as to enable them to match with national and international competitive atmosphere. The scarcity of trained teachers is quite evident from the fact that the vacancy announced and published as such by the Government of Bihar is not enough. Turning to the eastern region, we find that the neighbouring states like Bengal, Orissa and other states, do have a huge demand of such hands but at present there is no way to get trained teachers for teaching in Government Sectors with similar situation prevailing in Private Sectors too. In near future, the National Council for Teacher Education is thinking of improvement in Indian Education pattern for meeting competition on global scale. To add to the intensity and gravity of the problem aforesaid, the private sectors, affliated and non-affliated Institutions upto + 2 level will also make it mandatory on the teachers to be appointed that they must be trained as per the pattern mentioned above. In view of the situation prevailing on the national and international horizon, "Sant Maalik Memorial Institute" is preparing in the way to trained teachers. This institute will leave no stone unterned to achieve the goal by providing all facilities to the trainees in right direction. In keeping with the development and process oriented objectives of Teacher Training Programmes in this area should aim at developing in the student teachers concept, competencies, attitudes and skills related to emplimentation of a developmentally appropriate curriculum based on child centred activity and play based approach to Teacher Training Programme. The area encompassed in the curriculum would be cognitive and language development, health and nutrition, scio-economical development, physical and psychometry development, aesthetic development, creativity and play, programme, planning and school organisation, community mobilization and participation. Within these broad guidelines the curriculum is flexible to accommodate different approaches and schools of thought on Teacher Training Programme for starting a Teacher Training Education in Bihar.